SALT LAKE CITY – Nine Auburn 3-pointers and a 56 percent shooting clip in the first half was too much for the Jayhawks to overcome as the No. 5 seed Tigers topped No. 4 seed Kansas, 89-75, in the second round of the NCAA Tournament Saturday night inside Vivint Smart Home Arena. Kansas was led by redshirt-junior forward Dedric Lawson, who tallied his 22nd double-double of the year via a 25-point, 10-rebound performance. Kansas’ season ended at 26-10 as the Jayhawks failed to reach the Sweet 16 for the first time since 2015. Auburn moved to 28-9 in its 2018-19 campaign. The Tigers came out of the gates on fire from beyond the arc, connecting on six triples before eight minutes could come off the clock. The Auburn defense made it tough for the Jayhawks to keep pace during the early run, forcing five turnovers and limiting KU to just four field goals in that same span. The Tigers’ Jared Harper swished one of his team’s nine first-half 3-pointers with 12:05 to play in the frame and got his team out to a 28-11 early advantage. Lawson and Devon Dotson converted on five free throws while the Jayhawks momentarily silenced the AU shooters to get their deficit down to 14 points, 34-20, with less than eight minutes to go in the opening frame. The Tigers responded and quickly snuffed out any KU momentum. Auburn converted on back-to-back triples to get its lead to 20 points for the first time on the night. Those two buckets ignited another AU run prior to halftime. Chuma Okeke’s lay-up with 5:13 before the break kick started an 11-2 Tiger stretch to close the half and Auburn headed to the locker room with a 51-25 edge. It marked the Jayhawks’ largest halftime deficit in a NCAA Tournament game. Kansas came out of the intermission intent on getting back into the game. KU hit each of its first seven shots, scoring 16 points within the first four minutes following the restart. But the Tigers started the half just as efficient, hitting their first six tries from the field to hang onto its 20-plus point edge. 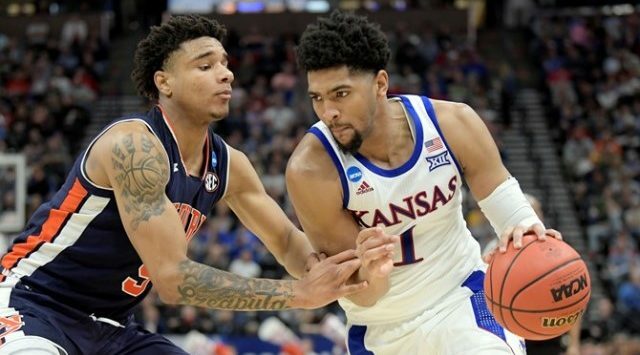 Lawson and Quentin Grimes tallied six points during an 8-1 KU run that got the Jayhawks to within 18 points with 14 minutes to go in regulation, but as they did all night, the Tigers once again had an answer. Bryce Brown’s hot hand struck again with his seventh 3-pointer of the night to start a 9-0 Auburn spirt that got the Tigers their largest lead of the game at 76-49, still with more than 12 minutes to go in regulation. Despite the Tiger’s continued responses, the Jayhawks didn’t give up. Lawson scored 12 points during a stretch that saw the Jayhawks outscore the No. 5 seed 21-7, helping KU got its deficit down to 13 points, 85-72. But the run came too late as only 90 seconds remained in regulation. Auburn managed to hold off the Jayhawks from there, sealing the 89-75 victory. Lawson closed the night leading the Jayhawks in scoring for the 21st time on the season and tallied his 21st double-double in the process. The Memphis product notched 25 points and pulled down 10 rebounds to post the third-most double-doubles in a single season by a Jayhawk. Quentin Grimes went 5-of-11 from the field en route to a 15-point performance and fellow freshman Dotson added 13 points. Freshman forward David McCormack rounded out KU’s double-figure scorers with 11 points to go along with six rebounds. The Tigers ended the night shooting 52.5 percent (32-61) from the field. It was just the second time a KU opponent shot better than 50 percent on the year. The Jayhawks hit 59.4 percent (19-32) of its shots in the second half and outscored Auburn 50-38 in the second half. That number included a 5-of-9 clip from 3-point range.